This page and was first made sometime around 1998 and has not been updated very much since then. There are now several other sites dealing with the artistic side of maille and more information of this sort can be found through those sites. This particular page is unlikely to likely gain any new content over the years. Full Persian. Best way I can think of to describe it is as a Boxchain turned inside out, but that's not entirely true because it is a 6 in 1 weave, and nothing like a 6 in 1 Boxchain turned inside out. 4 in 1 Half Persian... a very attractive weave.. looks really nice if two different colored metals are used as shown in the lower of the two pictures. The colors did not scan as well as I had hoped, they are much more vivid in person. 3 in 1 Half Persian chain, view from the top and bottom. Made from 20ga (.035") rings with an inner diameter of about 3/16". 3 in 1 Half Persian sheet. 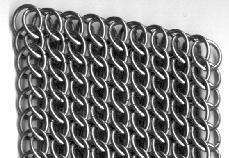 This example was made from the same rings as the above chain, the resulting sheet is rather tightly woven, but not so tight that it stiffens the weave. There are many variations of persian sheet, this is the most basic of them (and has a "/\/\/\/\" cross section). In theory, this weave could be build in three dimensions. 4 in 1 Spiral Chain. This is the easiest persian weave chain to make.. it's major downfall is that to keep the spiral shape it needs to have tension kept on both ends to keep it from unspiraling. This one is made of 20ga (.035"), wrapped into rings with an inner diameter of about 5/32" or a little under 3/16". This is a spiral chain that was made with rings that are slightly to small to twist into a smooth spiral. But it does look nice in it's unspiraled state... in a chaotic sort way. It was made with the same wire as the one shown above, but with an inner diameter of 1/8". Here's a persian-sparal hybrid. The dark purple rings are the spiral part, the magenta/pink rings are the persian part. The persian part passes through the spiral to make a spiral chain with a + or x shaped cross section. The ratio between wire gauge ring ID in this piece (20ga, 5/32"ID) is not favorable for chains because it formed a very stiff chain that desires to form its self into something that looks like an earthworm that fried it's self on the sidewalk on a hot summer day. A different ratio of wire gauge to ring ID would prolly work pretty good. A european 4 in 1 spiral cylinder chain... this is another one of my Home Brewed Weaves.. it came to me while I was doing some english homework so I made it between classes the next day. It looks really nice if it is made from more than one color wire. 4 in 1 Boxchain. Can be made by folding a strip of Euro 4 in 1 (shown above) in half and "sewing" up the open side. This one was made with 18ga (.045") 1/4"ID rings. Bird Cage, Byzantine, Idiot Trap, and Fool's Dilemma. It's a variation of Boxchain where the "boxes" are spaced apart, usually by two (doubled) or three (tripled) links, or by a single thick gauge ring. Here's some European 6 in 1 weave made with 1/4"ID 18 gauge stainless rings. ...and here is a 6 in 1 Boxchain. any #-1 box should be possible, but I haven't bothered because I've never had a need for this 6-1 variation. ...a European "3 in 1". the basic part of this weave is 3 rings through a 4th and as these sections go together the number of rings in the top row alternate between one and two. the sections are linked just like European 4 in 1, with a fifth ring going through four others. This weave is done by making short sections of euro 4 in 1 strip and connecting them together. In this case the sections are three rows wide, with three rings in the first and third rows and two in the second row. Rings on two oposite corners of each end are then flipped up into the other row. The sections are then connected together just like the standard 4 in 1 weave. A variation of european 4 in 1. Three rows wide, outside rows are 20 gauge, center row is 16 gauge. This is where the 4 in 1 variation pictured above is a lot different than standard european 4 in 1. The small links are too tight to fit another 16 gauge link through them so a new way of connecting the strips was needed. The idea of using vertical links to connect the rows of horizontal links was taken from the japanese/oriental weaves. It works quite well in most cases with this weave. Pictured here are three "stands" connected together. The first two have the grain running in the same direction. The third (bottom) strand has the grain running the opposite direction (inverted) and it's a little tight with this weave. Same idea as above, just put together a little differently. ...and here it is two strands wide. The strands are sewn together as mentioned above, using small vertical rings to link together the large horizontal rings. ...and here it is with grain running in opposite directions, or inverted.